20 years after the debut of the GX-01 Soul of Chogokin Mazinger Z comes a totally re-designed, high-tech version of the iconic character! 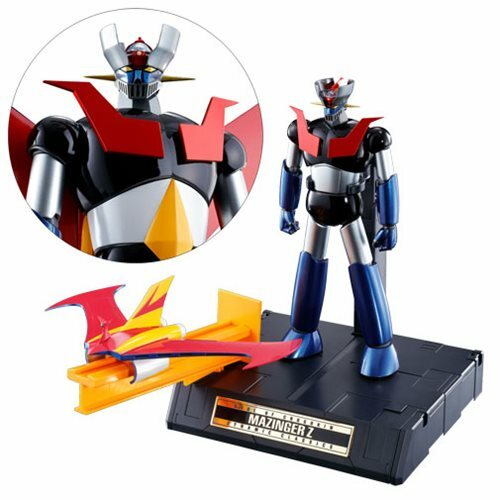 The GX-70 Mazinger D.C. (Dynamic Classic) re-engineers the proportions, accessories, and posability for incredible anime accuracy! Set includes a 6 3/4-inch die-cast metal and plastic action figure, a Jet Pilder, a Jet Scrander (late version), a landing strip for same, two pairs of option hands, two Ironcutter fists, a custom stand with two support arms, and other option parts! Ages 15 and up.